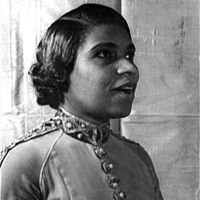 As a teenager, Marian Anderson worked at low-paying jobs in Philadelphia, Pennsylvania, in order to earn money for her singing lessons. Do you think she ever dreamed of performing at the Metropolitan Opera ("the Met") in New York City? If she did, the support of her family and community helped make that dream become a reality. On January 7, 1955, she became the first African American to perform at the Met, America's most highly esteemed opera house. Anderson sang the role of a fortuneteller in an opera by the Italian composer Giuseppe Verdi, called Un Ballo in Maschera ("A Masked Ball").